Probably the last thing you want on your escape to the Sunshine State is to stand in line at a theme park or get run over by Spring Break crowds. 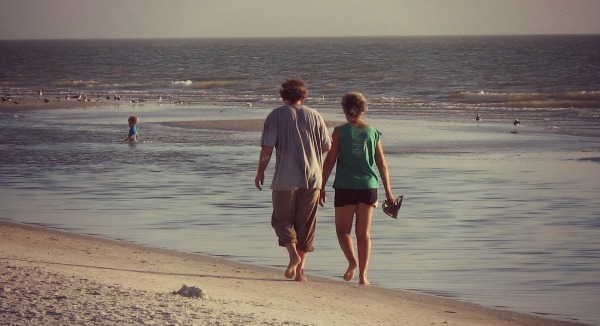 So we've compiled some of our best romantic Florida vacation ideas, photos and reviews for couples looking for relaxation, quiet(er) beaches, and things to do "for 2". 1. Naples - while most of Florida's Gulf of Mexico Coast is highly attractive, we find Naples just a little bit extra-awesome. It's got a beautiful main street, several very impressive boutique hotels and inns, and outstanding dining spots of all description. Of course, because it's on Florida's West Coast, you get a stunning sunset on the beach every evening. 2. Key West - despite the first 1/2 of the journey south through the Florida Keys beginning to resemble a strip mall, the end of U.S. Highway 1 is still worth the drive. There's a small supply of nice beaches to be discovered, delicious Key Lime pie to try, and a small gathering of musicians and street performers ready to join you in saying goodbye to the sun every night at Mallory Square. 3. St. Augustine - if you like a little history with your sunshine and sand, you'll be well pleased with your time in "the First Coast" as St. Augustine's known. Besides the Old Village trolley tours and cobblestone streets, you'll find quite a collection of small romantic inns here. 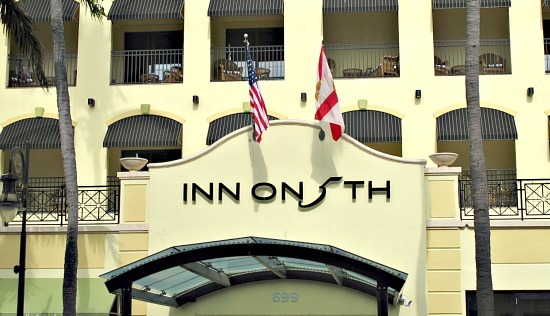 Inn on 5th, Naples FL - perfectly located in the heart of downtown Naples, The Inn on 5th provides an ideal couples getaway, anniversary or honeymoon on the Florida Gulf Coast. 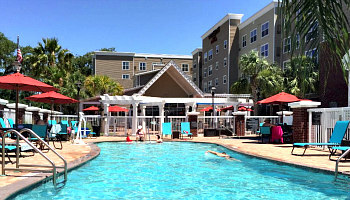 Orlando FL Romantic Getaways - Orlando? As in WDW? Yup, there's many reasons why you might find yourself here: the cheapest flight to Florida you could get was to MCO, breaking up a north to south road trip, or, you're doing it for the kids. So let us share with you a few parts of the city and the greater Orlando area that we discovered were ideal for a romantic weekend, day or evening away. Fort Myers Romantic Getaways - a re-invigorated downtown River District along with miles of soft Gulf Shore sand await romantic travelers who head to the "City of Palms". We've got tips on romantic things to do, places to dine, and 2 romantic places to stay for a getaway or honeymoon in Fort Myers & fort Myers Beach. 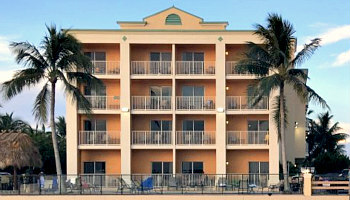 Naples FL Romantic Getaways - as described above, a very romantic spot for a week or weekend on the Gulf Coast. We've got some suggestions and ratings by couples for places to stay and where to eat in Naples, one of the nicest small cities anywhere in Florida. 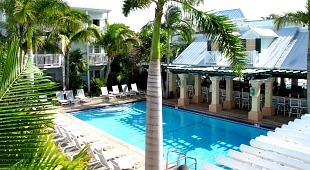 Key West FL Honeymoon Vacations - rather drive to the Caribbean than fly? Key West is as close to the tropics as you can get in the continental USA. This guide can help you locate a super-romantic honeymoon package, resort and suite in Key West. Ft Lauderdale Romantic Weekend Getaway Ideas - imagine a somewhat more laid-back version of Miami Beach with affordable hotels and parking. If a day on the sparkling Ft. Lauderdale sand still leaves you craving more "refined" surroundings, just hop on over to the shops and cafes on Las Olas Boulevard. See our Ft Lauderdale travel tips for couples, including romantic hotels and packages. 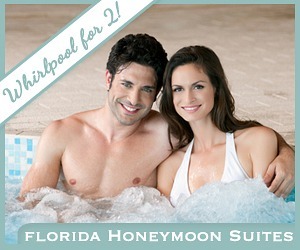 Florida Jetted Tub Suites - reviews of hotels and inns with honeymoon whirlpool suites in South, Central and Northern Florida. Miami's Most Romantic Hotels - South Beach not only has sand, sun and sea, but the Art Deco district is also "the scene" and the place to be seen. 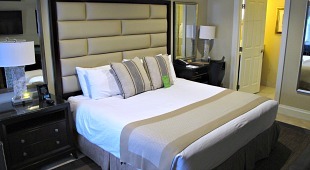 See what "SoBe" inns and hotels are terrific for a romantic vacation or South Florida honeymoon. We compressed 2 weeks worth of romantic travel in Florida down to 2 minutes of video clips from great places like Ft Myers, Miami, Key West and more. Hope this brief montage of destinations helps inspire some ideas in you for your next getaway to the Sunshine State. Ft. Pierce - lots to take in here, including a visit to the adorable Cobb General Store (established in the late 1800's) as well as a walk through the restored waterfront. Amelia Island - synonymous with romance and Florida, this romantic Barrier Island in the NE tip of the state is filled with parks, beach walks and charming old homes & shops in the Historic District. Flagler Beach - more than just another piece of nice white sand, Flagler excels in wildlife viewing opportunities (including whale watching) as well as a number of excellent seafood restaurants and waterfront pubs. Up to 50% off Romantic Inns in Miami, Key West, Orlando & more - Fontainebleau Miami Resort, Hilton Grand Vacations Suites Orlando International Drive, and Hawks Kay Resort in the Florida Keys are just a few of the properties on sale here. Save up to $500 on Florida Vacation Packages from $254 pp! - air & hotel packages with stays in romantic Marriott, Hyatt Regency and Hilton hotels and resorts in Orlando, Ft Myers, Palm Beach and more. 1. Lover's Key, Fort Myers Beach - with a name like this, it has to be near the top of romantic sandy spots in the state, right? Pay the fee for entrance to this state park (2015 rates are $8 per vehicle, well worth it), and you'll find plenty of space, choice hidden trails and spots for relaxing, and a chance for spotting dolphins or manatees just offshore. 2. Sanibel Island - the sand is specacular in most Florida beaches, but Sanibel seems extra nice. Plus, it's a quiet spot most of the time, and a great place for shell collecting. 3. South Beach, Miami - it's not all about just the sand. Being in SoBe is an experience in itself, and a stroll along the soft sand or streetside along the restaurants in the early evening is one of the special things the two of you should not miss in South Florida. 4. Amelia Island - if you'd like to hear the ocean, and nothing else, Amelia Island is a fine choice. And those pictures of romantic horseback riding in Florida? Probably taken here. 5. Naples Beach - sunsets are spectacular on the Gulf side, and especially enjoyable when you've just had drinks and a fine meal at one of the romantic dining spots in this "sophisticated-but-not-snobby" small city.